For the airport, see Congonhas-São Paulo Airport. 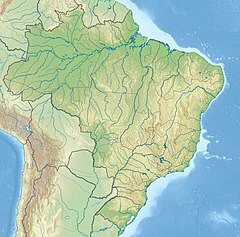 Congonhas (Congonhas do Campo) is a historical Brazilian ceety locatit in the state o Minas Gerais. It is situatit 90 kilometres (56 mi) sooth frae Belo Horizonte, the caipital o state o Minas Gerais, bi the heich-gate BR-040. The ceety haes a population o 50,000. The ceety is notable for its basilica - the Santuário do Bom Jesus do Matosinhos - an associatit soapstane sculpturs which wur commissioned bi Portuguese adventurer, Feliciano Mendes in the 18t century. It wis creatit bi Aleijadinho, ane o the best airtists in the baroque style in the warld. The twal sculpturs o auld testament prophets aroond the terrace are considered amangst his feenest wirk. In 1985 UNESCO grantit the Sanctuar the title o a Warld Heritage Steid.